I still have a hard time believing that I actually made yogurt at home. This is going to be one of the easiest, yet most impressive recipes you’ve made. It’s really simple, and I refuse to complicate it in a long drawn out post. All you need is 2 quarts of milk and 1/2 cup of plain yogurt with active cultures. 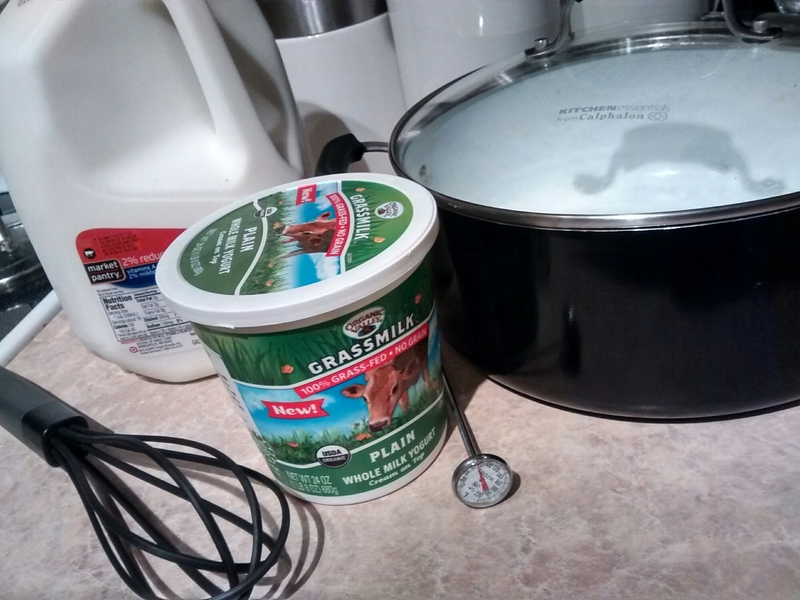 Heat the 2 quarts of milk to almost boiling (200 degrees), then let it set until just warm (115 degrees). 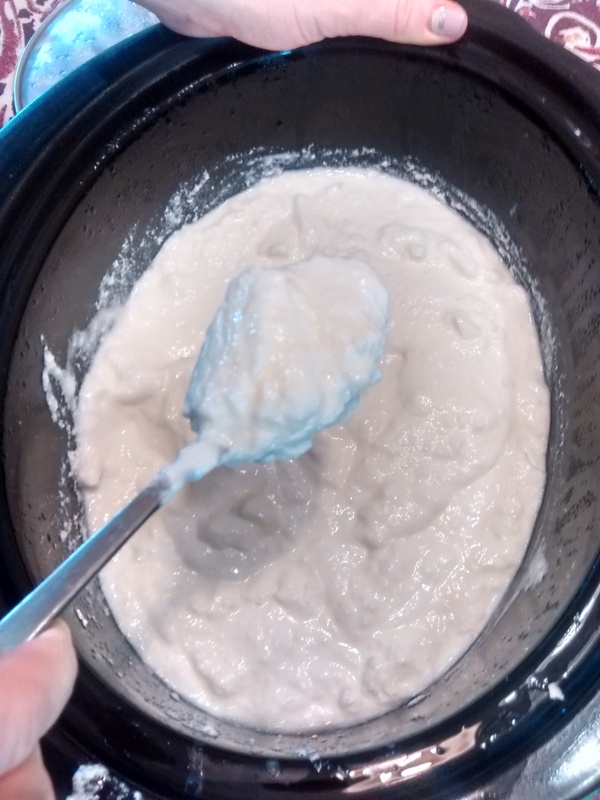 In a separate cup, whisk 1/2 cup plain yogurt into a bit of the warm milk, then mix it all together. Leave in warm place (I used my oven with the pilot light on) for 8 hrs or overnight. It will look similar to the picture above. Chill in fridge for a few hours, scoop out the liquidy whey, stir to smooth out the chunks, and serve! Heat, cool, mix, set in oven, chill in fridge. This yogurt is quite a bit thinner than store yogurt, but I have a theory that I’m going to test. Hopefully I can make it thicker without extending the waiting time. 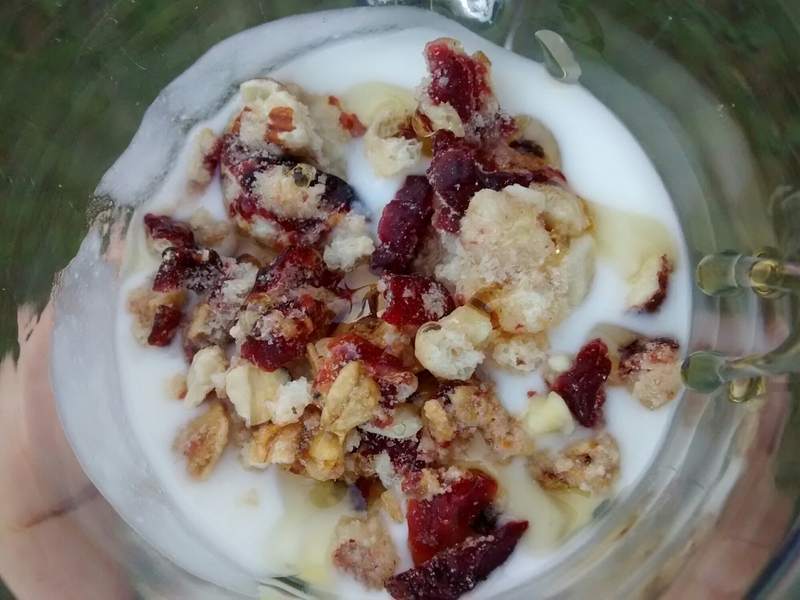 So far I’ve enjoyed my yogurt mixed with a bit of blueberry jam(if you like fruity commercial yogurts you will probably like it this way), in a peach smoothie, and with granola and honey. 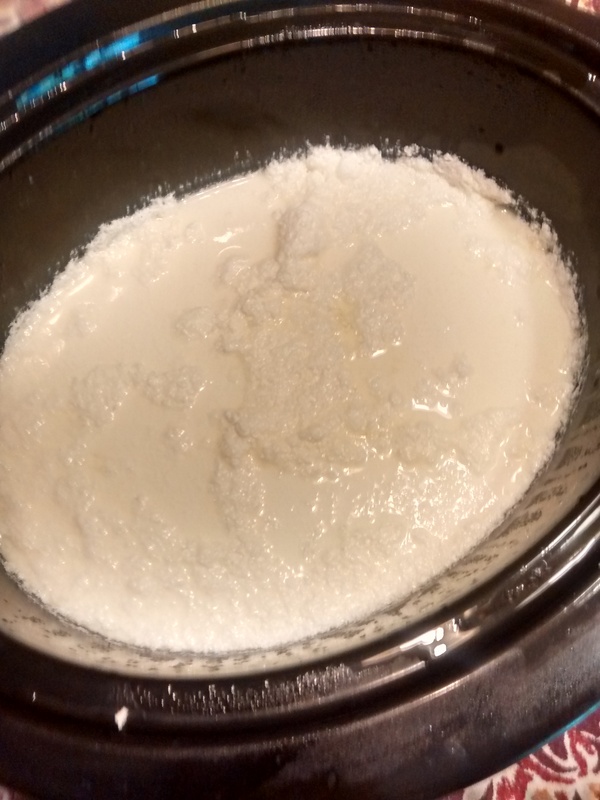 You have got to try making yogurt! I thought it was one of those complicated products that needed special equipment and expertise, but if I can do it in my kitchen, so can you! If you try it, I’d love to hear about it! 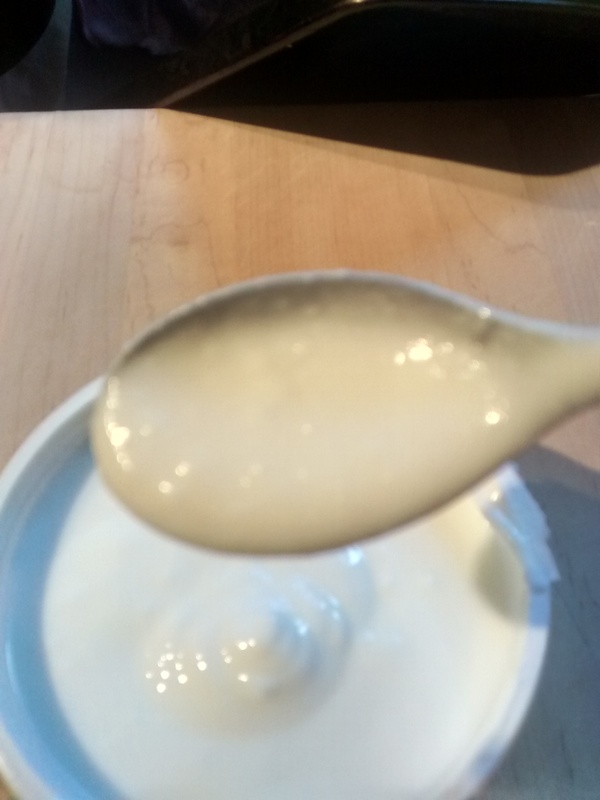 I love making my own yogurt. We won’t buy yogurt in the stores anymore since we started having homemade. There’s none better. I just had some as a snack. So good. When I make my next batch I’m going to experiment with straining it. Hey Sarah! Love your blog! It was so great to meet you + your husband last night @ your church! Such a blessing to be there and I’m looking forward to following along on your blog here. So cool what you’re doing with your blog. I loved talking gardening with you all too. We go through so much milk and milk products that it is helpful to cut costs there whenever possible. I’m so happy to have you following along with me, and I enjoyed browsing your blog last night as well. Thanks very much and this will be one of the very many things I will plan to try. Right now I have a lot of things in pots like champanel grapes, paw paw seeds, soon to arrive will be pomegranates and some Shangri-La mulberry cuttings to pot. I also have some persimmon scions for grafting and three more pear scion varieties coming. I just ordered some everglades cherry tomato seeds along with seeds for the three sisters that I always wanted to try, but will replace their squash with cushaw squash that I think is better our NW FL climate. I am also trying to root some Catawba cuttings that nourish the Catawba worm. I will try to also grow maypops, Right now I have a most unhappy dog since she is wearing an e collar to keep her from bothering an infected paw. At least she has quit crying about it. But is insisting on laying right next to me. Her job is chase away things like raccoons and such from my garden and orchard. The cone of shame. Poor puppy. Hope she feels better soon. The squash vine borer is such a pest here, hopefully the cushaw squash will be able to resist their attacks. Happy gardening- you always have such wonderful plans!